I've got another pistol/trigger accent mani for you! I had to do a short and sweet manicure as I rush out the door. It's crazy how often that seems to be happening nowadays. The three fingers are done with Master Shake (Daring Digits). 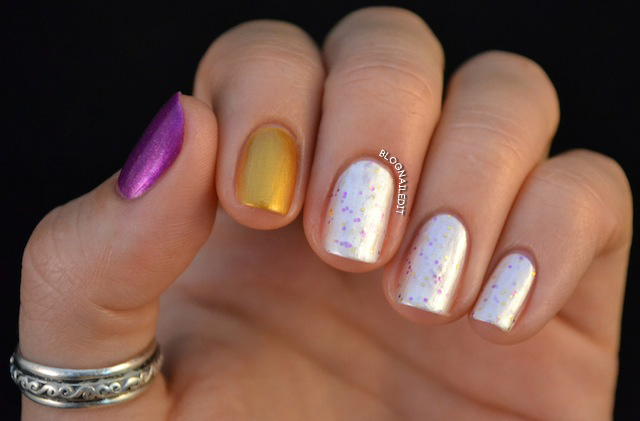 The gold is Zoya's Goldie and the purple is Senorita Bonita (China Glaze). I usually steer wide and clear of metallics, but I don't mind these. The streaky white effect you get with Master Shake still bugs me, and I didn't have time to fix it using Leslie's sponging technique. It's still a pretty little polish color though. I matched the two accent fingers to the glitters inside it almost perfectly!